CJ Starr was raised all over the Midwest, but his comedy was born in Texas at local open mic in Corpus Christi, Texas over 10 years ago. His comedy continues to make all crowds laugh about the things that make him win step-dad of the year and anything else that can happen to a mid-30's man as he tries to figure out what he wants to do when he grows up. CJ Starr’s Comedy can relate to any audience as he makes fun of his upbringing, his bi-racial marriage, family, kids, stereotypes, jail time, and view more..
CJ Starr was raised all over the Midwest, but his comedy was born in Texas at local open mic in Corpus Christi, Texas over 10 years ago. His comedy continues to make all crowds laugh about the things that make him win step-dad of the year and anything else that can happen to a mid-30's man as he tries to figure out what he wants to do when he grows up. 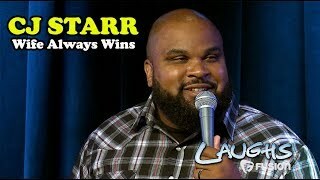 CJ Starr’s Comedy can relate to any audience as he makes fun of his upbringing, his bi-racial marriage, family, kids, stereotypes, jail time, and 10 years of Community College. His comedy is very versatile; as well as his fans he has acquired over the years and that is why he has fan base includes every walk of life. In the past couple years alone, CJ Starr was picked to perform at Gilda’s Laughfest, East Texas Comedy Festival where he was voted Crowd Favorite twice, voted top 40 in The World Series of Comedy, and headlined one night The Amsterdam Comedy Festival in Dallas, TX. He has continued to expand his comedic talent as writer and actor for the soon to be release Web series “Giggle-Lows”. In 2014 CJ Starr appeared in commercials for Hyundai and Wal-Mart, not to mention just film a set for Fox series Laughs all will probably never be aired. He has a Podcast called “Starr Struck “ where he interviews Comedians, Club owners, and anybody else that can give a great story that keeps the fans laughing. CJ Starr currently lives in Dallas where he has continued to work on his skills through touring at colleges, and clubs all over the Country, not to mention performing and promoting shows locally at the two Improv Comedy Clubs and two Hyena’s Comedy Clubs.